Please refer to our stock # gu1 when inquiring. This wonderful vintage cuff bracelet by "Off the Cuff" is a loyal rendition of a Gucci classic. It is 7/8" wide in front and has an adjustable wearable interior length of 7" to 7 3/4". 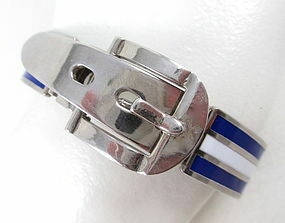 It is made from rhodium plated sterling silver and has blue and white enamel on the exterior. It has a file mark on the inner band were somebody tested it, but other than that it is in very good condition. It is hallmarked "Off the Cuff Sterling" on the inner band.